Editors’ note, Nov. 28, 2016: This guide was originally published in 2014. Some of these lenses are still for sale, but we have a newer guide with lenses for the iPhone 6 and 6s you should also check out. Thanks to the ubiquity of our smartphone cameras, we’re all taking more photos than ever. But those photos are largely confined to the iPhone’s one-size-fits-all, somewhat wide angle lens; gone are the days when most of us were willing to schlep around an SLR with multiple lenses, or even a single bulky zoom lens. You can recapture some of your SLR’s interchangeable lens flexibility, however, with a set of add-on lenses for your iPhone. We’ve rounded up 6 of the most popular options and put them to the test: Here are our recommendations. 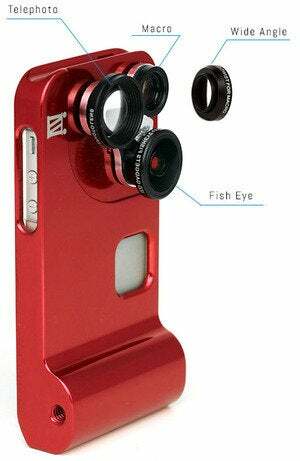 Some lenses attach directly to the iPhone; others work in conjunction with a custom case. iPro’s Lens System is an example of the latter—after you slide your iPhone into the sleek two-piece sleeve-style case, you attach the lenses via a bayonet mount that is secured with an easy quarter-turn of the lens. We especially like iPro’s clever solution for carrying the lenses. Rather than storing them in some sort of case or bag, they screw together into a cylinder that you can hang around your neck. It also doubles as a handle that screws into the case, which you can use as a monopod to stabilize your photos. You can even mount the case on a real tripod. The basic Trio kit ($229) comes with three lenses: a 2X telephoto, a super-wide angle, and a macro lens. You can also purchase additional lenses, such as a powerful 4x tele and a 165-degree wide angle. Notably, iPro is the only company that calls attention to its glass. Specifically, the lenses are made with Schneider Century optics, a staple in the film industry, and the quality is obvious. When compared side by side with images from the other lenses in this roundup, iPro was the sharpest. 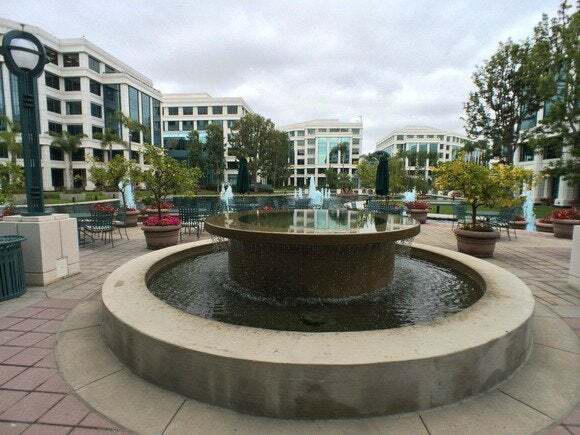 Compare, for example, any of the fisheye lenses: Fisheye is hard to do well, and iPro came the closest to DSLR-quality results. To save space, the Olloclip has lenses on both sides of the clip: You get a wide-angle or fisheye lens, depending upon which way you point the kit, and unscrewing the wide-angle lens reveals a macro underneath (at both 10X and a 15X magnification). Olloclip has the strongest macro lens available for the iPhone, but no telephoto magnification. 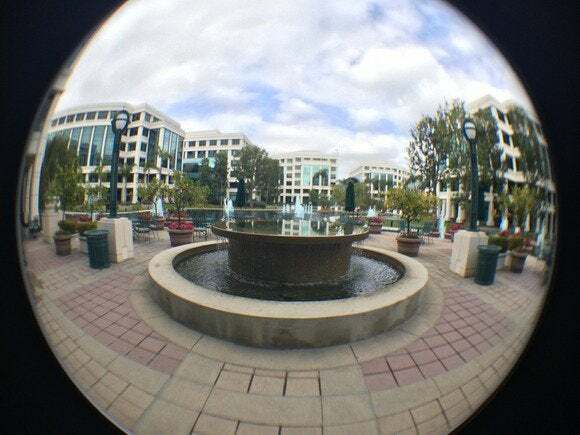 Given the modest design (and price) of the Olloclip, you might not expect much. But the image quality is among the best of the lenses we tested, rivaling the iPro with good sharpness throughout. It’s too bad there’s no telephoto lens option in the base kit—though you can pick up a separate telephoto kit for $100 on the company’s website—but if you’re a close-up fanatic, you’ll really appreciate having two different macro magnifications. It’s a unique feature among iPhone add-on lenses. We’ve seen no end to the way add-on lenses can be added to the iPhone: screw-on, bayonet-mount, even affixed carousel-style to the case itself. Photojojo takes the prize for the most innovative solution (and one sure to befuddle the Insane Clown Posse): magnets. 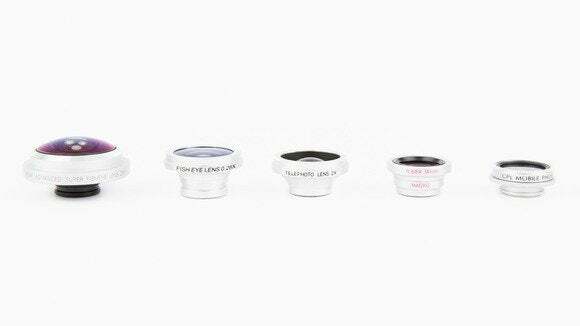 The Photojojo Lens Series lenses come with a tiny magnetic ring and adhesive on one side. Affix it to your iPhone (centered around the camera lens) and wait a half hour or so for it to set. After that, you can pop any of the lenses on with a satisfying dink, as the magnetic base of the lens grabs on. The lens pulls off just as easily. Photojojo sells a total of five lenses, available individually ($20-$30) or as a set ($99): a fisheye, super fisheye, 2X telephoto, a combo wide angle/macro, and polarizer. They all affix via the same magnetic ring. It’s a clever way to temporarily attach lenses to your phone, but it does require you to semi-permanently adhere a metal ring to the front of your phone. You’ll want to make sure the lens is centered properly before you start shooting, as the magnet doesn’t always align the lens perfectly. 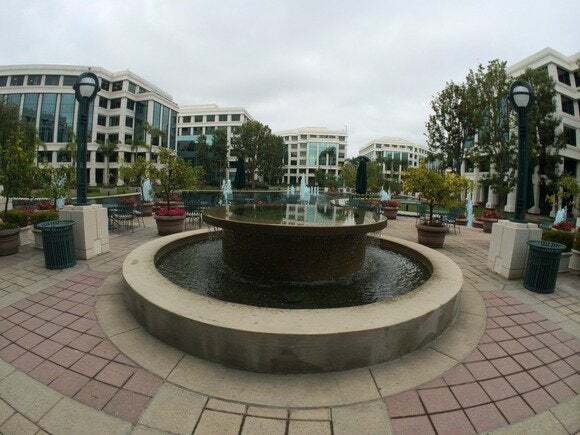 And the super fisheye lens is so heavy that it is only barely supported by the magnet – more than once, I moved my iPhone too quickly and gravity pulled the beefy lens off like a bottle rocket. Photojojo offers a great value—you get a lot of lenses for $100—but the image quality is only middling. 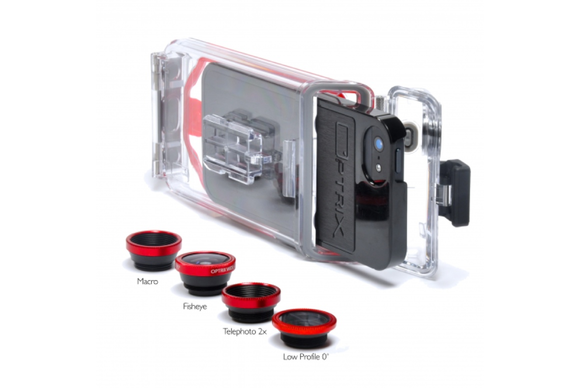 What do you do when you’d like to use a variety of lenses on your iPhone… underwater? You’ve really only got one choice: It’s time to gear up with an Optrix PhotoPro X ($150). The case is waterproof to about 30 feet, which means it’s safe to use while your phone is in the rain, on a boat, or even snorkeling underwater. The watertight case affords you access to all the device’s controls, including the Home button, volume controls, power, and touchscreen. Our test kit came with four lenses: a 2X telephoto, a fisheye, a macro, and a polarizer, all of which fit in an elegant, rugged case. And there’s a variety of additional lenses available as well, including a super wide-angle lens that’s well on its way to being a fisheye—parallel lines noticeably curve under its gaze—and a 4X telephoto. (Optrix reports that in the future, the PhotoPro X kit will contain the wide angle lens in lieu of the fisheye.) 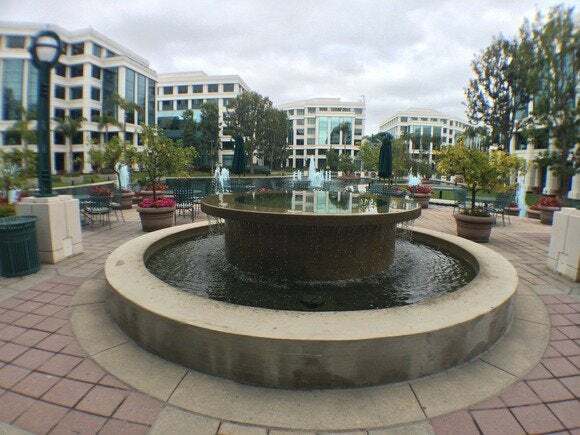 Image quality is good, but not great, trailing the Olloclip in overall sharpness. Beware: If you’re taking this rig underwater, you’ll need to exercise care. Optrix includes a half-dozen O-rings; you’ll need to ensure one is securely installed before screwing in a lens. If you goof, you can flood the case, ruining your phone. iZZi’s Orbit Pro ($230) takes a different approach. Rather than building a modular system with interchangeable lenses, the ORBIT Pro is an iPhone case with permanently integrated lenses on a rotating mount. To use the Orbit Pro, you first slip your iPhone into a flexible plastic sleeve, then push it into the machined aluminum case, which features a camera-like profile, complete with an ergonomic grip and tripod mounts. One big plus: holding the Orbit Pro is a lot like holding a traditional camera. To switch between the fisheye, wide angle, and 2X telephoto lens, just spin the lens assembly until the desired lens adapter is in position. There’s also a macro lens under the wide angle lens; just unscrew the wide angle adapter to access it. While there’s an undeniable convenience factor to having the lenses permanently attached to your case, you won’t want to use the Orbit Pro except when you’re actually taking pictures; it’s simply impractical as an ordinary case. 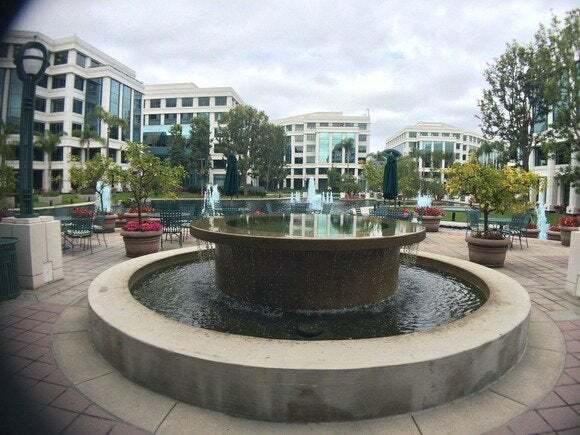 More importantly, both the wide angle and telephoto lenses suffered from mild vignetting—the lenses cut off the corners of the photos, so zooming or cropping is a must—and the telephoto produced significantly softer photos than other tele lenses. 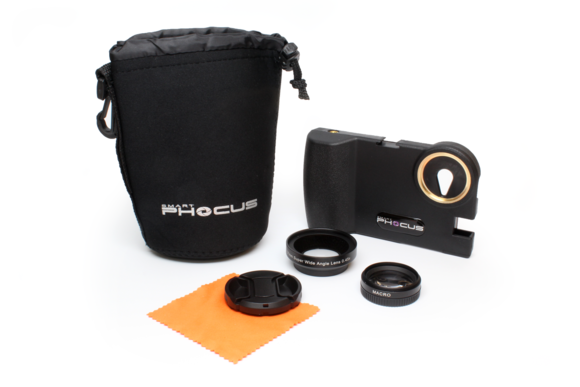 Not entirely unlike iZZi, Smart Phocus puts your iPhone in a case that resembles a compact camera. But where iZZi snugly form-fits the iPhone with a frame that’s machined from aluminum, Phocus is a somewhat bulky plastic case that makes your phone about .75 inches wider. And while iZZi places three lenses on a spinning carousel, Smart Phocus goes the interchangeable lens route. We tested the two-lens kit (telephoto and a combination macro/super wide angle lens, $75); a three-lens kit ($100) is also available and includes a fisheye lens. You also get individual lens bags and a heavy duty neoprene sack for storage. The case has three tripod mounts and a “shoe mount” on top, designed to accommodate Smart Phocus accessories like an LED light and microphone. While we appreciate the expandability, these small cut-outs make it difficult to reach controls. The power button, for example, is all but impossible to access. And it can be challenging to extract the phone from the case when you’re done. While we wanted to like the Smart Phocus, we can’t recommend it: The case suffers from good intentions and bad implementation. The lenses are huge—twice the typical iPhone lens, at 2 inches in diameter—but that didn’t really help image quality, and the telephoto lens suffers from significant vignetting, much like IZZI’s lenses. Moreover, the lenses are difficult to use. The threads can be difficult to line up correctly, and we worried constantly about stripping them. Removing the macro/wide angle combo is an exercise in frustration; the macro lens gets “stuck” on the case, so unscrewing the lens combo serves only to unscrew the wide-angle lens, leaving the macro behind. Getting the macro lens off is not unlike trying to get the cap off a bottle of ketchup—quite difficult and likely to cause much frustration. Thanks to a wealth of innovation among lens makers, you can match the lens kit to your lifestyle. iPro has the widest range of options, especially for tele shooters who want to extend the reach of their iPhone, and the best overall image quality. For the ultimate in convenience—but still a healthy dose of image quality—slip an Olloclip 4-in-1 in your pocket. We really want to like Photojojo’s fun and highly cost-effective magnet-based lenses, but there’s always the question of what to do with a handful of tiny lenses when you’re not shooting with them. If you have a good answer to that quandary, they’re fun in a way no other lens set can match. And if you want to get your iPhone wet while equipping it with better optics, the Optrix PhotoProX is your only choice (and a pretty good one at that, as long as you take care to mount the lenses properly). Only the Smart Phocus and IZZI options give us some pause, with clumsy cases and image quality that doesn’t live up to the price tags for their respective solutions. While we wanted to like the Smart Phocus, we can't recommend it: The case suffers from good intentions but bad implementation. Photojojo offers a great value, but the image quality is only middling. With a durable design and high-quality optics, the Olloclip 4-in-1 is the perfect accessory for iPhone-toting photography geeks.